I wanted to test the performance of the Edge-TPU on my Raspberry Pi3, and as I have every application running on Docker on my Raspberry Pi, I've created a Docker image with everything inside that you need to start using the Coral USB accelerator. Additionally, I've added an example that uses the PI camera and streams the image to a web-server with the result of the classification printed over the camera image and I included Jupyter with an example too. After installing Raspbian on the Rasbperry Pi. Then, connect the camera to the CSI interface (if you want to analyze life images), the accelerator USB Egde-TPU to a USB port and power on the Raspberry Pi. Then, use raspiconfig enable the camera interface and reboot the Raspberry. After doing that, you need to install the Docker engine. I wrote a tutorial: #Tutorial: Docker on Embedded Systems (Raspberry Pi & Beagleboard) that can help you. After installing the Docker engine, I recommend you to deploy the Portainer container. This is also explained in that tutorial. Then, you can access to the website on e.g. http://<<ip-address-rpi>>:8000. Parallel access to this website is not working, and if you want to refresh the website, just do it twice ;) Some improvements are needed on this file. I've included an image classifier example, and also some animal images to test it. If you want to, you can run the Container in iterative mode too. Note: if you do not want to use ssh and you've deployed Portainer, you can use the console provided by Portainer. Just click on the >_ icon and then press the Connect button. You can use a pre-trained model, or you can wetrain a model, or you can build a model from scratch, here you get some information. The Coral website provides pre-trained TensorFlow Lite models that have been optimized to use with Coral hardware. I've included the "MobileNet V2" model inside the Docker image. This recognizes 1,000 types of objects. If you’re just getting started, you can just download other models and deploy it to your device. You can retrain an existing model and customize Coral’s pre-trained machine learning models to recognize your own images and objects, using a process called transfer learning. To do this, follow the instructions in Retrain an existing model. If you need to train a model from scratch, you can follow the steps in Build a new model for the Edge TPU. Note that your model must meet the Model requirements. Currently, the Edge-TPU only supports TensorFlow Lite models. This means you have to convert tflite models to tflite-tpu. If you're a PyTorch user or prefer another framework, you can try to convert your models to TensorFlow using ONNX. I used the base image balenalib/raspberrypi3-debian for my image. I did not use the raspberrypi3-python because I wanted to reduce the image size, and I got an error when I tried to install the edge-tpu library. The Docker image uses supervisord, you can run more than one program in parallel. Firstly, I thought to run also the image classifier parallel to sshd and Jupyter, but then I realized that it was better to build a generic image that can be extended. 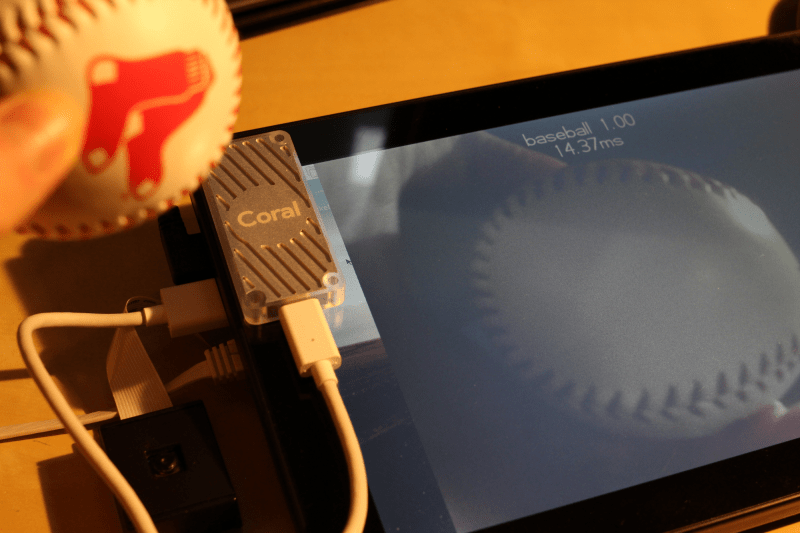 This post brings five things together: Docker, Jupyter, Raspberry Pi, Pi Camera and the Coral USB Accelerator. If you want to test the portable Edge-TPU accessory, this is an easy way to do that. The Edge-TPU performance is really good. It significantly reduces the time to classify offline images as well as live images from the Pi camera. In the next articles, I'll be posting some results.